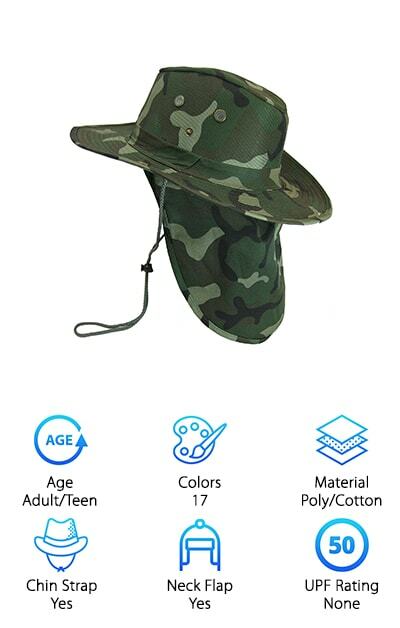 The boonie hat is a common sight on the heads of hikers, beachgoers, and campers. It dates all the way back to the Vietnam War when U.S. Army Green Berets started wearing them in the field. To help you find the best boonie hats, we researched a variety of new and best selling products. 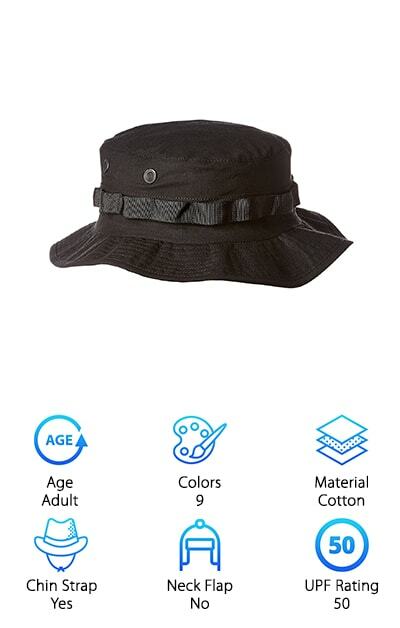 The result is the top ten boonie reviews below, including the best sun hats for kids. Before we get started, here’s what you need to know when shopping. 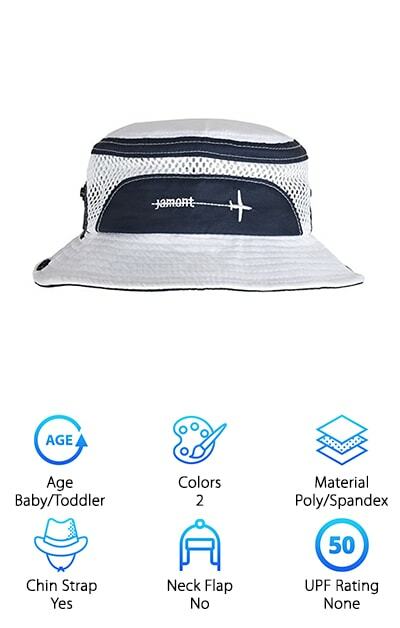 Age: We wanted to find the best sun hats for babies, and the best ones for adults too. You will see a wide age range on the boonie hats on our list below. Pick one up for each member of the family! Colors: Some of the best boonie hats for sun that we selected come in upwards of a dozen colors. There are also lots of camouflage patterns, which are a popular choice. For each hat we will tell you the number of colors. Material: Boonie hats often come in a blend of synthetic materials, and sometimes cotton too. Nylon hats may be great at wicking away moisture, for example, while polyester holds its shape well even when the hat is rolled into a pocket. Chin Strap: A chin strap is a helpful addition because it will hold the best boonie hat for fishing firmly in place as you cast. 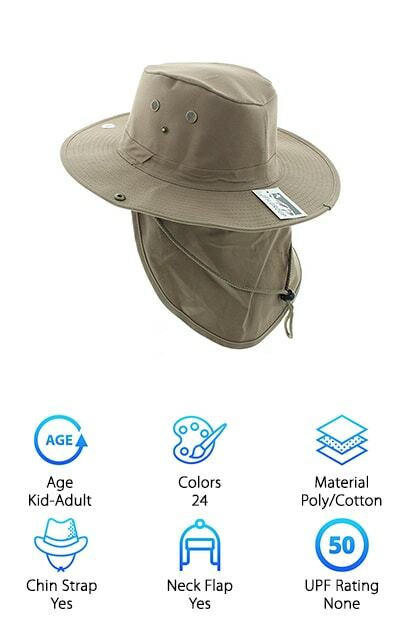 It will keep the best sun hat for hiking from wobbling as you climb. It’s very helpful! Neck Flap: A neck flap pulls double duty for the user. It keeps nasty weather like rain and snow off of your neck as you go about your business. And when the sun is shining brightly, it protects your most delicate skin. UPF Rating: If you’re familiar with the sun protection factor in sunscreen, the UPF rating is the same thing – but it is given for fabric. It stands for “Ultraviolet Protection Factor.” It is a measurement of the UV protection factor in boonie hats. While all of our choices offer protection from the sun, this spec will let you know if the hat has been specifically rated or not. Now that you know how to choose a great boonie hat for all-weather use, let's get right to the reviews. Here's the deal: If you're in a hurry, take a look at the top pick and the budget pick. Both are fantastic products and are among the best boonie hats we found. Right below, you'll find all runner-ups in our hat reviews. If you're looking for the best boonie hats for hiking, fishing, and gardening, they are on this list. A good boonie hat is a lot like carrying an umbrella around with you all day, with about 1% of the hassle. There is a reason why they are considered one of the best hats for boating. They always keep you in the shade! Our top pick is the Columbia Sportswear Bora Bora Booney Hat. This is the kind of item you want to have on hand for your next vacation, your next hike, or your next venture onto the water. It is going to collapse for packing without getting all wrinkly, and it will dry very quickly after getting dunked. Choose from 4 colors: Collegiate navy, fossil, grill, and sage. (Those are fancy ways of saying blue, beige, gray, and brown.) You get UPF 50 sun protection, too! The sweatband will keep sweat from dripping into your eyes, and an adjustable chin and head strap will customize the fit for you. This is a 100% nylon hat. Are you a big fan of camouflage? Do you like to blend in wherever you go? The Rothco Boonie Hat comes in 29 different colors and patterns, and over a dozen of those choices are camouflage designs. That includes black and white camo, pink and purple, and green and brown blends. It is the ideal hat for hunting grouse, deer, turkey, or anything else that will have you out in the woods and the fields. The Rothco Boonie Hat isn’t just one of our favorites – it is also our budget pick. 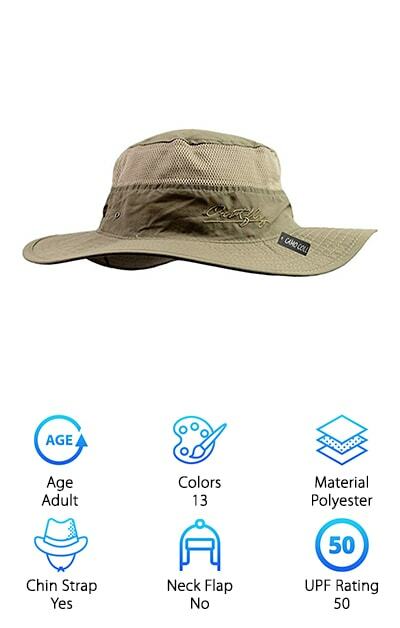 For this price, you will be able to pick out hats for the entire family and your next hiking or camping expedition. Rothco hats are a polyester and cotton blend. They have branch loops, and an adjustable chin strap so they will fit everyone just right. Select from hat sizes ranging from 6.5 to 8. There are also 4 screen vent holes for keeping cool as you work. The more versatile a hat is, the better it can be used. We all have that one incredibly comfortable hat that we keep in the car so that we can grab it whenever the elements require some shade. What, you don't have one of those? Then it is time to purchase the highly efficient JFH Booney Summer Hat. The name is a little misleading because this chapeau really works year-round. The polyester-cotton blend prevents it from wrinkling or losing its shape. The crown will keep its attractive appearance, and won't flatten and turn into a bucket hat. Sun and rain protection are both excellent, too. In addition to the wide brim, you have a large neck flap for shading the rest of your upper extremities. The mesh on top will keep air flowing and wick sweat away. With sizes from small to extra-large, and 24 color and design choices, even kids will find the boonie hat they love. Whether you are embarking on a sightseeing tour of Asia or throwing a barbecue in your own backyard, you need the right accessories. A good hat like the Camo Coll Boonie Hat is a must. This one is one of the best on our top ten list for skin protection, with a UPF rating of 50. It will block UV rays, and it still has vents to keep you cool and collected. It is soft, and won’t be too tight and give you a headache. If it is windy outside, use the drawstring cord! It will keep all of these functions in place and work properly. And check this out: The Camo Coll Boonie Hat is ultra-lightweight. The fabric will stay cool, and you won't have sweat pouring into your eyes. Instead of focusing on discomfort, humidity, and heat, you can make memories with your loved ones. 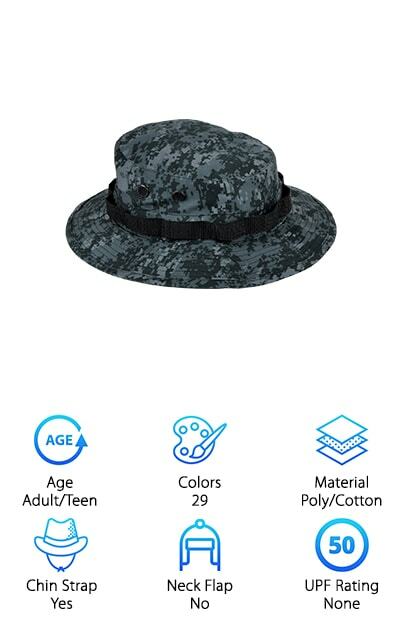 This boonie hat comes in 13 different colors and fits adults. 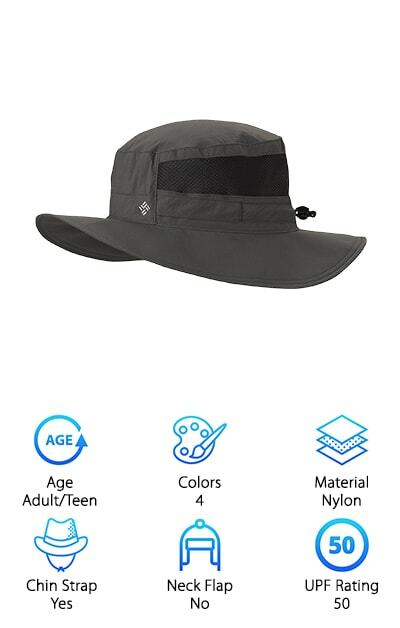 A good boonie hat can also accurately be called a “Dad hat.” It’s the sort of thing Pops will wear around the house, on the beach, and out on the boat. So, it’s only appropriate that we found the DealStock Boonie Fishing Hat. It comes in two sizes for adults, S/M and L/XL. Once Mom or Dad puts it on, they can use the chin cord to tighten it up or let it hang loose as they try to catch a few fish. It won't get in their way, and it will not overheat them. The DealStock hat is super-soft because it is made from 100% cotton. Any outdoor activity will be a breeze with this accessory pinned onto your head. Forget sunburn and prematurely aging skin, and say hello to fun. Some of the 15 colors you can choose from include white, beige, red, lime green, and blue camouflage. They are so affordable, you can purchase 2 or 3! Some boonie hats look a little better on gentlemen, but this one is designed for the ladies. Like all of our other boonie hats, the Siggi Women’s Boonie Hat is an ideal choice for travel and seeing the world. You can fold it up into a tight little triangle and tuck it into your suitcase or your handbag. It is also easy to clean, and you can air-dry it to retain its original shape. The Siggi hat has a very wide brim, providing an Ultraviolet Protection Factor of 50. It comes with a detachable chin strap. If you remove the strap, there are just two tiny loops left behind that can easily be tucked out of the way. What our reviewers really loved are the designs – there are 11 choices in all. Several have a lovely inner floral lining, while others have ruching, ruffles or fabric flowers on the outside. 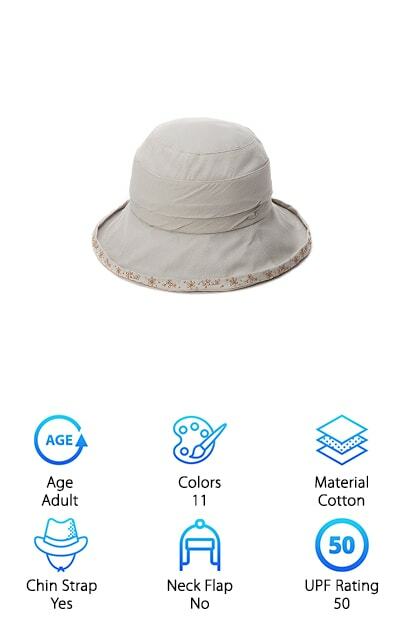 Select a hat that will protect you from the sun! When we said we were picking out great boonie hats for people of all ages, we meant it! The Eriso Toddler Boonie Hat is crafted for children ages 6 months to 2 years old. If you are planning a beach vacation or even just a day in the sun, this is the purchase you need. This hat will make your kiddo look like a smart little sailor, with the fetching plane embroidery on the front. 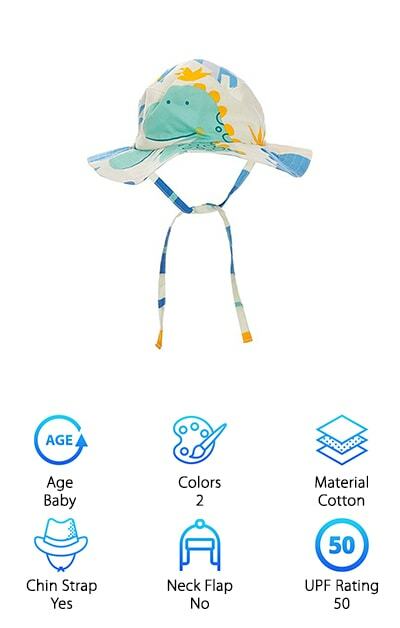 It is made of polyester and spandex, and it has a whole host of features designed to keep your little one cool and protected from the elements. The chin cord will keep the hat on his or her head, and the polyester and spandex-blend fabric will not hold on to water or sand if it gets dunked or dirty. There are snaps on each side to put up the flaps if you prefer that style. With breathable mesh on top, it's a winner! The ultimate hunter or outdoorsman’s hat, the S & W Military Boonie Hat is designed to protect you from the sun and keep you from feeling overheated. 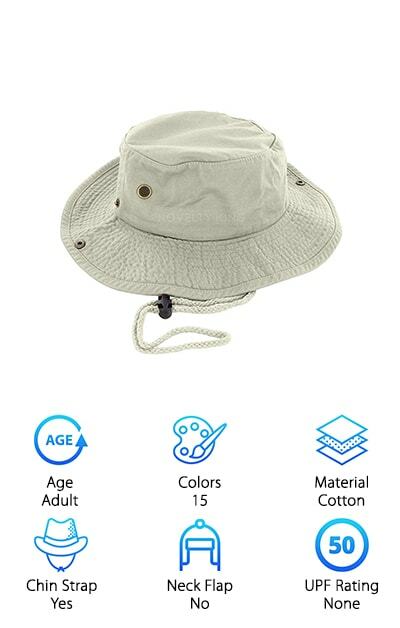 It gets the job done with a polyester and cotton blend, so that the hat is both soft and retains its form well after days, weeks and months of use. It is washable, and it will bounce right back into shape. Grommet eyelets and a mesh screen will keep cool air circulating around your scalp. You can also put the side flaps up with handy snaps. The color and design choices are great for people who are spending a lot of time in the woods, on the river or camping outdoors. Choose from shades like olive drab, and multiple camouflage options like desert, city, digital and green camouflage. There are 17 in all to pick from, along with sizes ranging from small to extra-large. You will like the neck flap and the chin strap, too. Babies need a lot of additional shelter from the sun. Their soft skin is highly sensitive. Whenever you are heading outside with your tyke, you want a hat within close reach. Bonus points if that hat can be crammed into the corner of a diaper bag or a beach bag without losing its shape! And it doesn’t hurt to select something adorable, like the YX Baby Boonie Hat. It is made from cotton, and it can be tossed right into the washing machine. The colors will not run. Parents will love the easy chin strap, which can be tied loosely or placed in a bow to hold more firmly on windy beach days. The hat comes in two designs, dinosaurs and a floral with butterflies. Both have a UPF of 50, so this hat along with liberal application of sunscreen will keep baby safe from the elements. Choose from small or medium sizes, with a brim of 6 or 8 centimeters. The boonie hat and even the name has United States military roots. It is an international favorite, however, for how easy it is to use and to transport. Tru-Spec Military Boonies fit well and are extremely comfortable, and they can be crushed into a pocket to use later. They are made according to U.S. military specifications, and bear many similarities to the original boonie hats developed in the 1960’s, and utilized by the United States Army, Air Force, Marine Corp and the Navy. The hat comes in 9 different colors, including 5 camouflage choices, khaki, and black. Inside the brim is a "map pocket," beloved by collectors. The sizing is for adults, with brim options from 7.25 inches to 7.75. The chin strap is adjustable, and brass screen vents on the sides improve airflow. This hat is 100% cotton, so it is washable and easy to keep cool. It will keep you shaded on hikes, vacations, and other fun activities.